I haven’t posted anything about the rebuild until now due our recent trip “oop north” for the wedding and to visit with friends and family. We were, effectively, away for ten days, So, as you can imagine, we were expecting some dramatic changes, big progress. Perhaps our expectations were not mixed with correct amount of reality but to say we were disappointed would have been an understatement. Initially we thought perhaps the guys had taken advantage of our absence to go off and work elsewhere. These views were, perhaps, fuelled in part by tiredness following our long journey back from Cumbria. The reality was that the guys had been busy while we were away. Much of what they had done was of the fiddly nature so the progress was subtle. The day we left the final plaster boarding was underway and plastering was completed that day. The temporary roof glazing has been removed, replaced by electric roof vents. 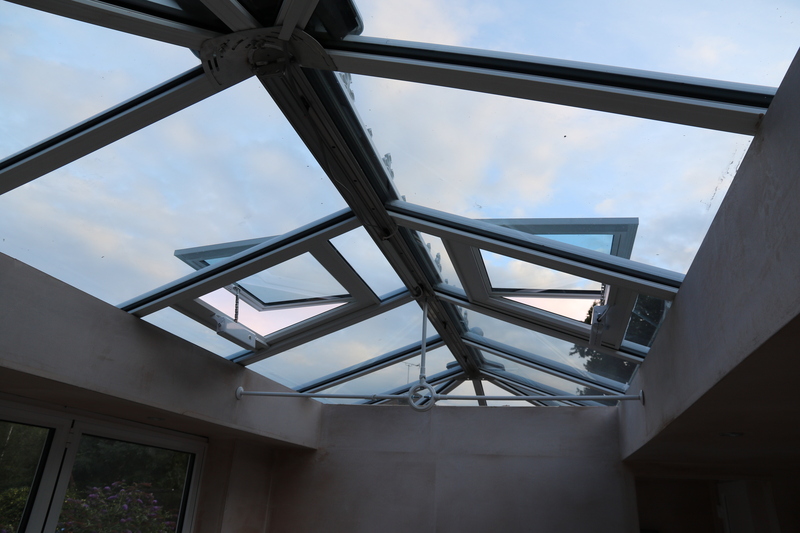 Conservatory – Electric roof vents have been installed, replacing the plain glazing panels temporarily installed. Conservatory – Wall mounted “flame effect” fan heater. Will supplement the radiator, if necessary, during cold weather. Externally, the cornice work has been installed although at the time of the photo it was not complete. 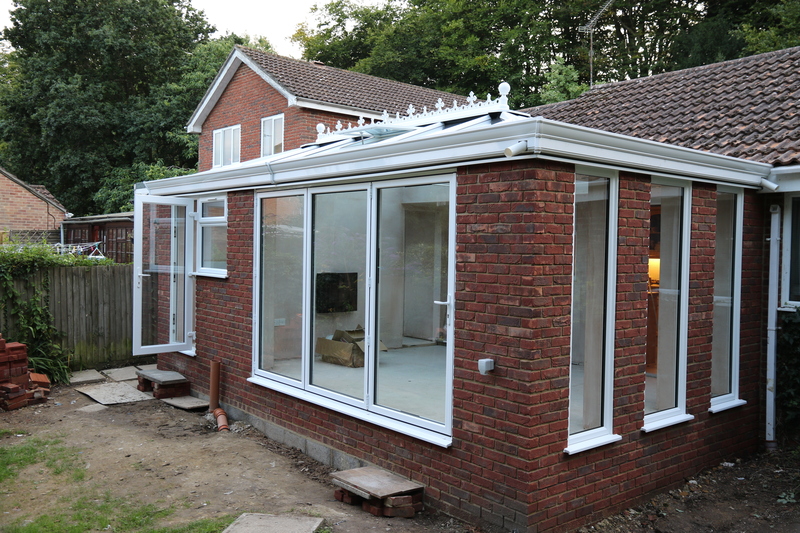 Conservatory – Cornice has been installed as well as two orbs to complete the finial along the roof apex. We have also gained two orbs to finish off the finial on the apex of the roof. Less obvious is the finishing trim that has been fitted around the three windows in the end wall, also the end caps for the sills and judicious amounts of silicon sealant. All of the glazing panels were tidied up, stickers removed and extraneous plaster removed from the plastic surrounds. On Saturday morning, after our return, the decorator arrived to paint throughout. He has applied two coats all round to the walls and perimeter ceiling. He has also applied two layers of undercoat to the “hidey / slidey” door. More trimming was carried out on Saturday as well as the downpipes for the guttering. 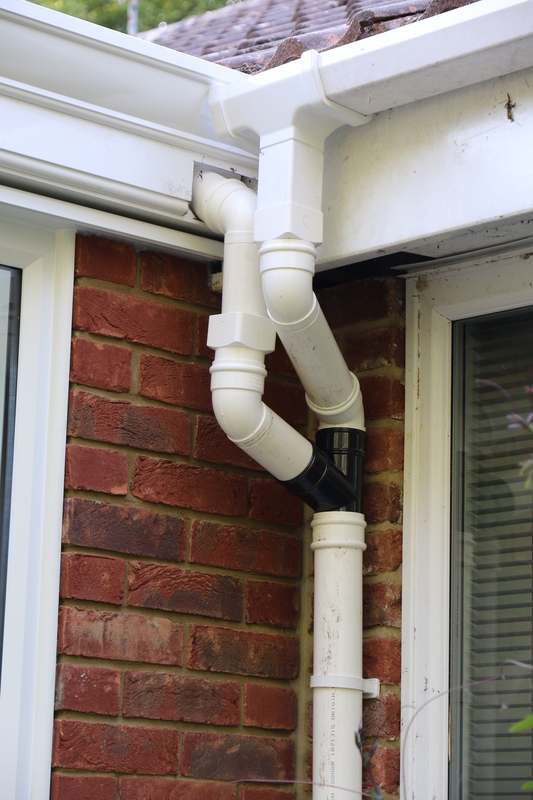 The downpipes where the new box gutter has to interface with the existing house guttering have proven to be a little more problematical. Conservatory – Wall art ? Box gutter and house guttering. Temporary solution. As of yesterday, Monday, floor tile laying has started. First thoughts are that the colour, Polished Ivory, looks good. It’s the first time that we have seen the tiles en-masse so we are pleased that we don’t feel like the colour choice was a mistake. 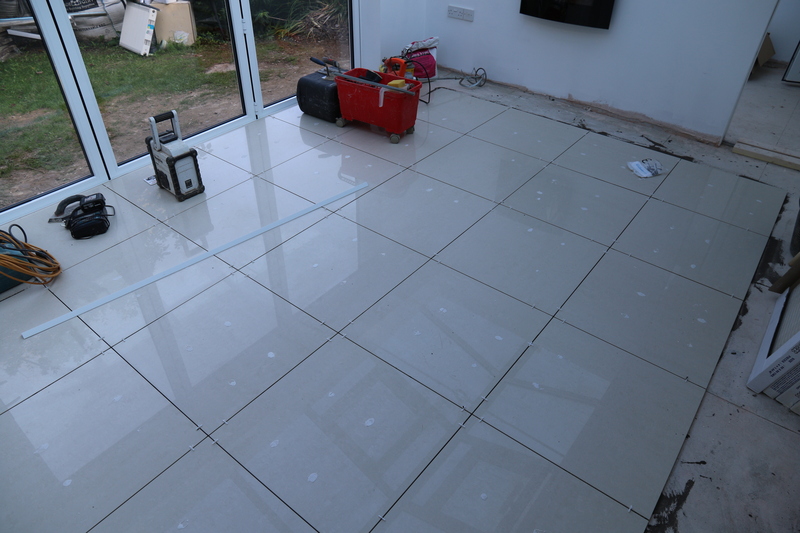 Conservatory – Floor tiling, no grout at this time. So, whats left to do ? Obviously completion of the tiling. However, completion in the utility area is going to be gated by the plumbers. There is a threat that they might put in an appearance today. We need them to, at the very least, bring the cold water supply up through the floor for the washing machine. Once that pipe is above floor level the tiles can be laid. Also on the plumbing front we are waiting for the washing machine drain and the installation of the tall panel radiator. 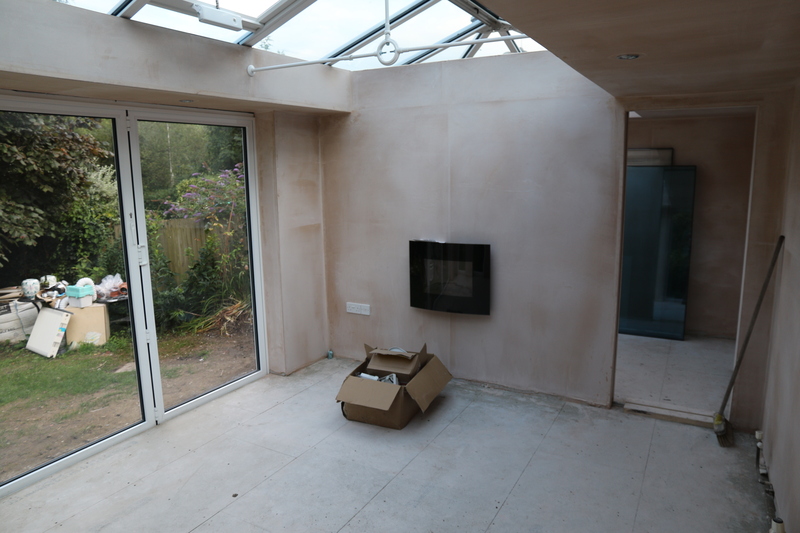 The partition wall is going to be capped by a glazed panel to complete the separation between utility and living spaces. Some trimming is also planned for the top of the perimeter ceiling. The bi-fold doors need some minor adjustments as they aren’t as free running as they should be. Guess who managed to snap a key, left in the central lock the first time I fully opened the doors. Important lesson learnt there then. 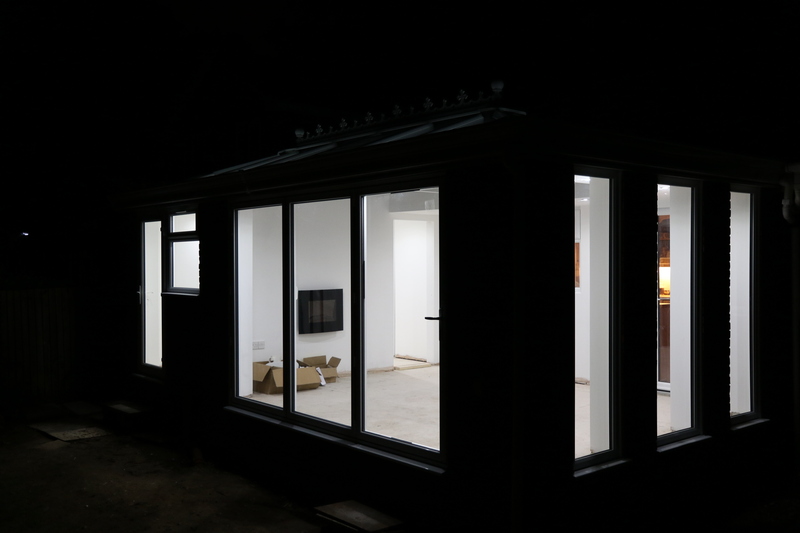 Conservatory – Late night illuminations. Once all the interior work is completed then, outside, construction can begin for the decking. Also creation of the steps down from the utility room. The side access paving needs to be tidied up too. So there is still quite a bit to do but am beginning to feel that we are nearing the end of this project. This entry was posted in Local (To Me !!!) 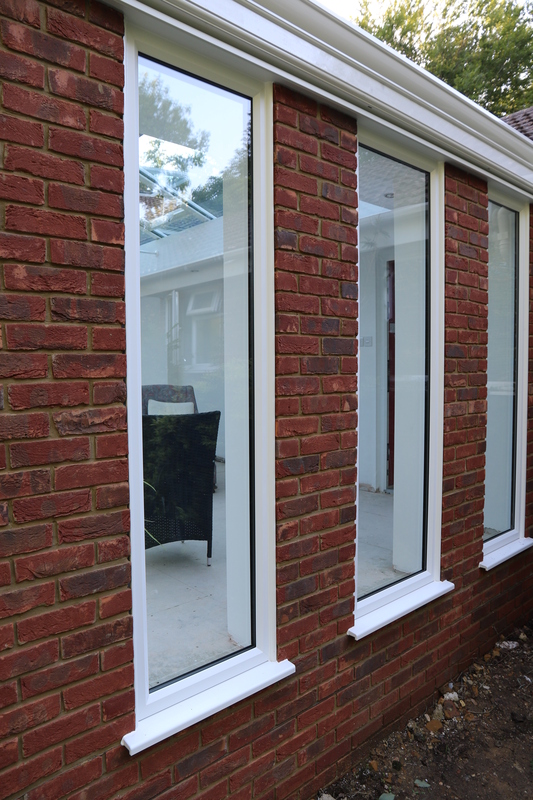 and tagged bifold, box gutter, conservatory, cornice, down lighters, electric, Executive Windows, finial, floor, LED, orb, plaster, plaster board, roof vents, tiling. Bookmark the permalink. Am really impressed with the amount of work involved. Looks lovely. Thanks Sue. We both just want it finished now. Seems so close, yet there is still much to do. 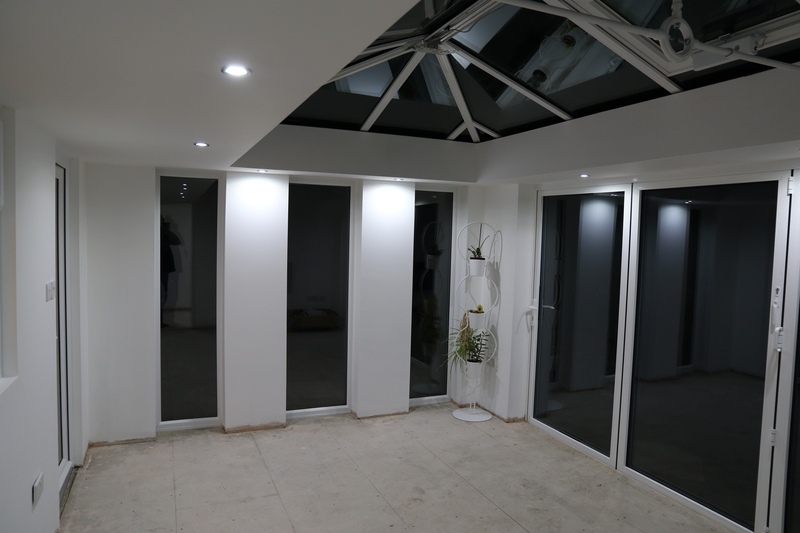 Trouble is, just like your house, completion of the conservatory is the key to starting on further projects thoughout the house.